The Collected Interior: Frugalicious Friday & A Giveaway...Stud Muffins! Frugalicious Friday & A Giveaway...Stud Muffins! Wahoo...welcome to the 37th edition of Frugalicious Friday! This day's all about sharing your fabulous, thriftiest, most frugalicious home decor finds! And if you revamped your find in a fab Craft or Diy project, well tell us about that too...we can always use a little extra Diy inspiration! Click here if you've still got questions. But I'm flexible guys... if you created it, then link up! We've got a fun lil' giveaway today from Stud Muffins. Have you heard of this Etsy shop? If not, let me show you the cuteness! 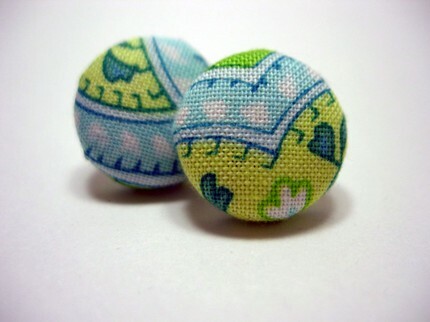 Yup, each pair of Stud Muffun Earrings...and their are a ton to choose from, are just $7.00 each! Wow, that's a great value...I know your going to love that! Okay, for our giveaway Stud Muffins is offering a $15.00 shop credit to one lucky Frugalicious Friday participant! 1. Link up our Fabulous Finds, Crafts and Diy projects...and leave a comment! 2. Follow Finding Fabulous, if your not already a follower...and leave a comment! Okay guys...link up, I can't wait to see your projects! I'll announce the winner in my Frugalicious Friday Favorites post on Tuesday or Wednesday of next week! I can't figure out how to link up sista! I don't see the link either! but im a follower! I just went to her etsy and ordered a pair.. I can't wait to get them!! I'm a follower! So want to get a pair of these! Me, too, now a follower, waiting for the link! im a follower and i love earrings!! I am already a follower too and love your blog. Thanks for hosting, Jane! I am linking up the two posts I did on my Goodwill finds from last weekend! Have a great 4th! So cute! I'm a new follower. I just linked up a project. cute earrings! I just linked up to the party! Thank you for hosting! Hope you don't mind I entered 3 this week, I just got them all posted! :) Happy 4th! Thanks so much for hosting! Can't wait to go visit all the fun projects!! Lovely giveaway and fab linky up as always! Many thanks! What a fun name "Stud Muffins"! Thanks for hosting the party, Jane. I'm a new follower and I linked up to your party! Thanks for hosting! I'm a follower. Looking forward to some great deals tomorrow at our Arizona goodwills for 50% off saturdays. I just became a follower! Love your site! This is my first time linking up to you but I can't find a button or anything to post on my blog. Am I missing something? I love that you featured the organization yesterday. That is really brilliant and I'm glad someone else thought so too! Thanks for providing a fabulous link party! I hope to have time to go through all the other links. Just got my blog up and running and am super excited to finally be able to join the party! Thanks for the chance to win. I just found your blog for the first time, becamea follower, linked to your party, and got some GREAT ideas while visiting! I'll be back tons! Thanks!